Reggie Upshaw scored 19 points in the win over Minnesota. The Middle Tennessee State Blue Raiders took control of this game early and showed they are much better than a number 12 seed, beating Minnesota 71-62 in the NCAA tournament Thursday. The Middle Tennessee State Blue Raiders keep showing the nation that they are a very underrated basketball team. Thursday they scored their second straight NCAA tournament upset over a higher seeded team, defeating the fifth seeded Minnesota Golden Gophers 81-72. Last year as a 15 seed they knocked off number two Michigan State in the opening game. This time they were seeded a bit higher at 12, but showed that was quite low as they led at one point by 16 points. Reggie Upshaw got seven of his 19 points after Minnesota had cut the second half lead to four points. Giddy Potts added 15 points and JaCorey Williams 13 for a team that is now 31-4. Amir Coffey tried to rally Minnesota, scoring seven of his 17 points during the rally that cut the lead to 62-58 with a little over six minutes (6:43) to go in the second half. Then Upshaw hit a three-pointer and a two-point jumper. Minnesota’s Nate Mason answered with a three-pointer, but Upshaw hit a contested fadeaway jumper. Then MTSU got a pair of free throws and coasted on to the victory. MTSU also showed this was no fluke win. They outrebounded the bigger Golden Gophers 37-24, and hit seven of 13 from three-point territory. 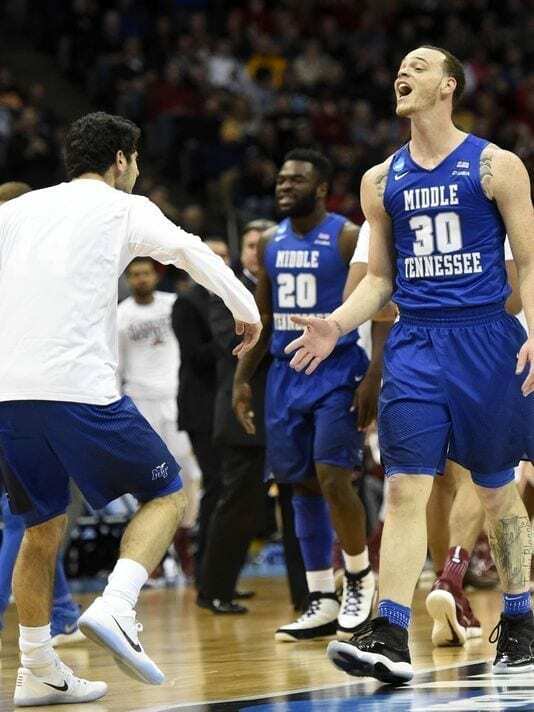 It is the first time in school history that MTSU has reached the round of 32 in consecutive years, and each victory adds to their record total. Now they face second seeded Butler tonight.